Come along with me to view what is coming or has happened (more books, events, appearances, workshops) including miracles not even yet contemplated. 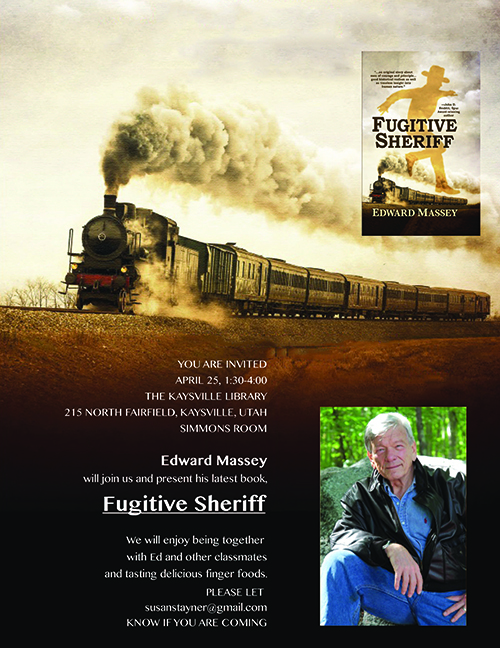 Sheriff John Simms, the father of Sheriff Mark Simms, is alive and makes his debut on April 17, 2019. Here and under the cover above are the pre-publication order links. 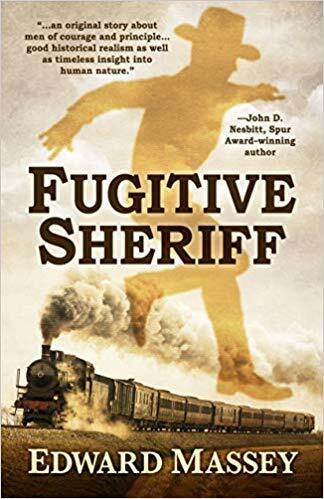 Sheriff Luke Simms, the father of Sheriff John Simms, has agreed with my publisher, Five Star, to take life and join his son and grandson in June, 2020. Until then, he wants all the focus to remain on his son, John, the Fugitive Sheriff. April 24, Parsons Behle & Latimer conference room on the role of U.S. Attorney William H. Dickson in founding their firm and in my book. April 25, Kaysville Library, on heritage, my high school friends, and President Taylor in 1887. April 26, Summit County, Kamas library, with the Silver Peak Writers on heritage, writing, and community. Newspapers, radio and tv stations have expressed interest. If anything is picked up, the content as well as the presentations will post here in the blog page. 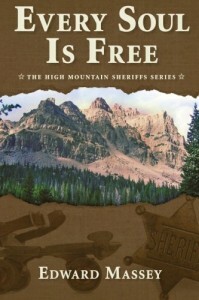 In 2014, the League of Utah Writers awarded Every Soul Is Free the Gold Quill award, (see below)Tempting the Gods, Sheriff Simms’s father, Sheriff Simms, has entered the 2019 competition. The award will be made at the League of Utah Writers Quill Conference in August, 2019. We’re hoping and we hope you are, too. Emil Franzi, the voice of Voices of the West, and winner of the Lariat at the 2014 Western Writers of America convention in Sacramento, will interview Edward on October 11. His show airs in Tucson, AZ, and the interview will be via telephone. A recording of the interview will be posted here on October 12. Tune in. Said to be the oldest art club in the nation after the Salmagundi Club in New York. It is a great honor to be asked to discuss the nexus of history and fiction in Every Soul Is Free. The novel is fiction but it is true in every detail, even when describing events that were created entirely for the purpose of telling a good story. Providence, R.I., Thursday, October 2, 2014. Edward met on September 12, 2014 with Belinda Kuck, Director of Davis Reads, and Pamela S. Park, Assistant Superintendent for Curriculum, Davis School District, to organize a program of speaking in the high schools of Davis County about life after Davis, literature, and the heritage of growing up in Utah. Ms. Kuck explained that they are trying both to use the school district to expand reading among all ages in the county and to encourage high school age students to read and write — more! These programs, naturally, use authors with established reputations to enhance the draw, but they are open to pursuing opportunities to support Davis School District alumni authors and their contribution to literature. Initially, there is a tentative plan for Edward to judge a short story contest. Keep watch for developments and schedule. A success quote/mantra that Fire Nation can apply to their journey. The story of the “AH-HA” moment and how you turned that light bulb moment into success. The story of your proudest Entrepreneurial moment. What is really exciting in your business right now? Share one personal habit that contributes to your success? What book would you recommend to Fire Nation? Imagine you woke up tomorrow morning, knew no-one, had a laptop and $500 dollars. What would you do? Every Soul Is Free is under consideration for the Western Writers of America 2014 Spur Award for Best Contemporary Western Novel. Ann Call and Susan Stayner invited friends and classmates from Davis High School, Class of 1960, to a reading and discussion and desserts at Ann D. Call’s home. 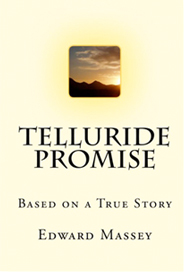 Several participants shared a pioneer heritage and, even without the posse, and how they lived the story of Every Soul Is Free, on September 12, 2014, in Bountiful, UT. See Reader’s Guide for the evening’s agenda. 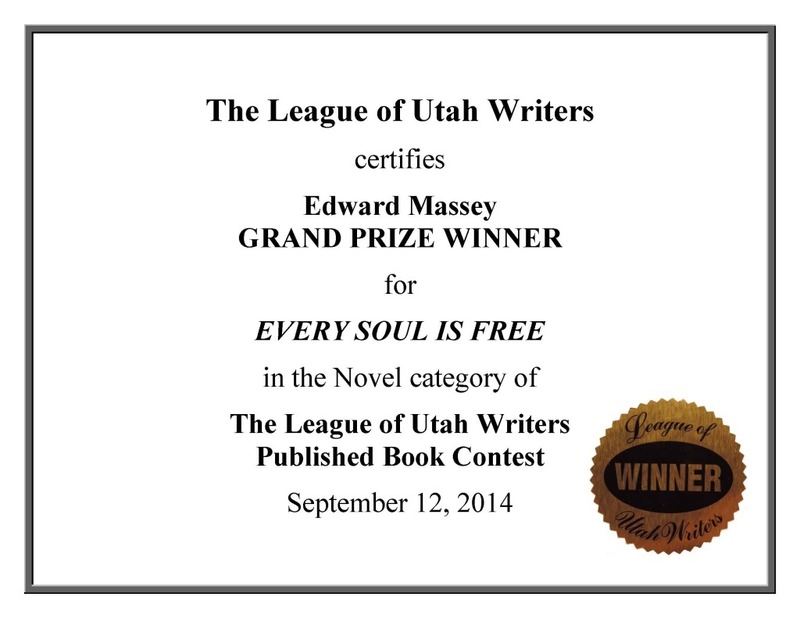 Every Soul Is Free is under consideration for the 2014 Best Published Novel prize for the League of Utah Writers. A short story, “Cybil,” that involves Sheriff Simms and his daughter is also under consideration for the best unpublished short story of 2014. The winner will be announced at the 2014 annual conference for LUW to be held at the Davis Conference Center, Layton, Utah, September 12-13, 2014. Book Club, reading, and discussion, September 9, 2014. Every Soul Is Free is under review for Annual Utah Sheriffs’ Association Conference and for various Sheriffs’ Department and Community Support activities throughout the year. Click here to learn more about Utah Sheriffs’ Association. Sheriff Simms is caught in conflict between calling and family and his deputies face stress and personal danger — realities that sheriffs and deputies need to shoulder and communities may better understand when explored in fiction. Every Soul Is Free, Sheriff Simms, and Edward Massey made more new friends and renewed old acquaintances at the Western Writers of America convention in Sacramento, June 24-28, 2014. It looked like every five years, I produced a book and a reunion. Fortunately the pace has been broken, but there will still be another Kaleidoscope of Passions this year.